Furnace Installation | Clean Air Act Inc.
It’s finally that time of year. Temperatures are steadily dropping, we’ve shut off our air conditioners, and soon we’ll be running our heaters not just at night, but in the daytime too. And every year, we get countless questions about these two things: How to get the most out of their heater, and how to pay the least in operational costs. The problem is when that need leads to some serious misconceptions about how heating works. We can’t blame you for wanting to reduce your heating costs, but some of these ideas can do the opposite of what you want. If you’re purchasing a new furnace for your Sherwood home, you want to avoid buying one that is undersized for your particular space. To do that, here are some common signs that the furnace isn’t powerful enough for the heating needs of your home. These signs might appear for an older furnace as well, especially as it ages and loses its ability to provide adequate heat for your home. The most common (and in many cases only) sign that your furnace is undersized is that the device simply doesn’t maintain the temperature in your home properly. This means that when turned on to full and left for a few hours, your furnace doesn’t heat your home to the thermostat setting. This can be due to an improper load calculation or a load calculation that wasn’t taken at all. The perfectly sized furnace will heat your home evenly on the coldest day your area is likely to have. So, undersizing should be pretty evident – if it doesn’t heat your home evenly and it’s not exceptionally cold outside, you might not have enough BTUs under the hood. The problem is one that varies depending on the severity of the undersizing. Modern furnaces are often available with two stages, meaning they can operate at both a low BTU rating (often around 40K or so) and a higher BTU rating (70K or higher). This is the perfect solution for homeowners worried about undersizing because it ensures that your home always has enough heat in reserve should the weather get exceptionally cold. For example, most furnaces are sized for extremely low temperatures, but if the temperature jumps up to 50 degrees F outside, your furnace is now oversized for that weather. A two stage furnace offers solutions for both common conditions and extreme conditions and will resolve most of the concern you have about undersizing and not having enough heat to offset outdoor temperatures. Most people, when they choose a new furnace for their Wilsonville home, think that “bigger is better”. However, an oversized furnace can present just as many if not more problems than an undersized furnace. 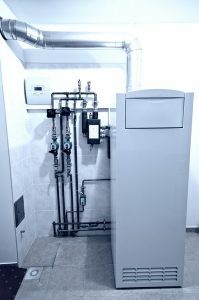 So, if you feel you may have overdone it in the past or you want to avoid making a mistake in the future, here are some signs that your furnace may be oversized.